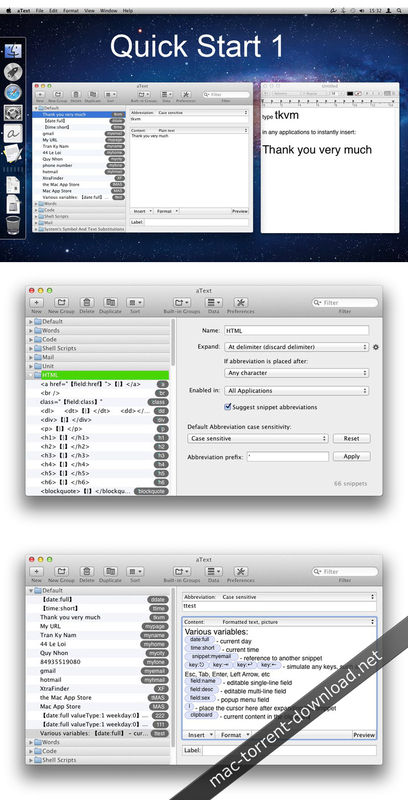 aText is a small but very powerful macOS utility that resides in your status bar and allows you to insert text snippets in any application by employing user defined abbreviations. The app is very easy to use, and once you create your text snippets database, has the potential to greatly improve your productivity. To be able to efficiently use the aText app, you must start by defining your own abbreviations database: in the app’s main window you must input the snippet content, and then assign a shortcut. To help you keep track of your entries, aText offers you the possibility to organize them by groups. In addition, the app also includes a basic sorting function that allows you to arrange the groups alphabetically, or the entries according to their abbreviation, content, creation / modification date, or by the last time when it was used. The aText abbreviations will by accessible system wide, but take into consideration that you actually have to type them: if you simply copy and paste the shortcut you will not be able to see any results. If you do not want to actually memorize the abbreviations, aText also enables you to see the full list of available text snippets in its status bar menu: simply select the one you want to use, and aText will insert it in the currently enabled text field. aText is a great tool to have around if you want to avoid typing the same text content over and over again: if you are dealing with repetitive tasks on a daily basis, this will save up a lot of time. Moreover, you can also use aText to insert images, date and time markers, and so on.